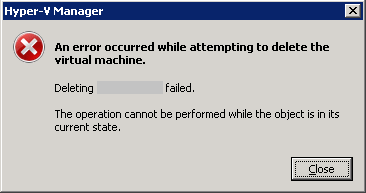 If you see such errors in the Hyper-V event log, and fail to delete the damaged virtual machine in the Hyper-V manager. Just go to ‘C:\ProgramData\Microsoft\Windows\Hyper-V\Virtual Machines’ and delete the file which filename is the same as the virtual machine ID. After that, the damage virtual machine should be gone in your Hyper-V manager. If you use SCVMM, you need to delete the VM in the SCVMM console as well.